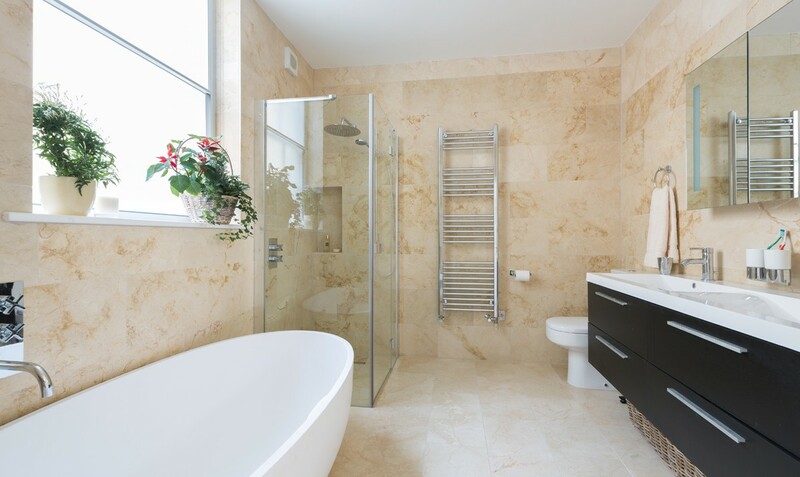 Regardless of your bathroom’s size, you’d probably love to have an even bigger bathroom without paying for costly remodeling. 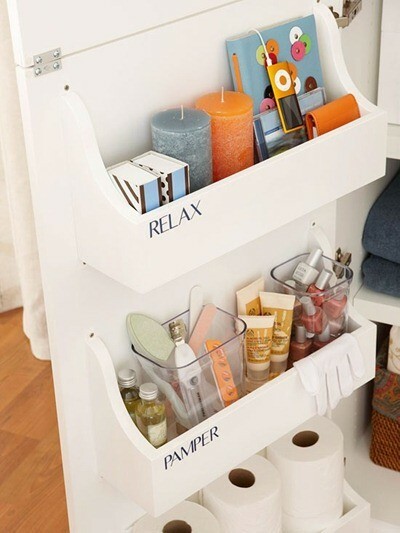 Here to help you do that are these 42 brilliant bathroom storage hacks and solutions. 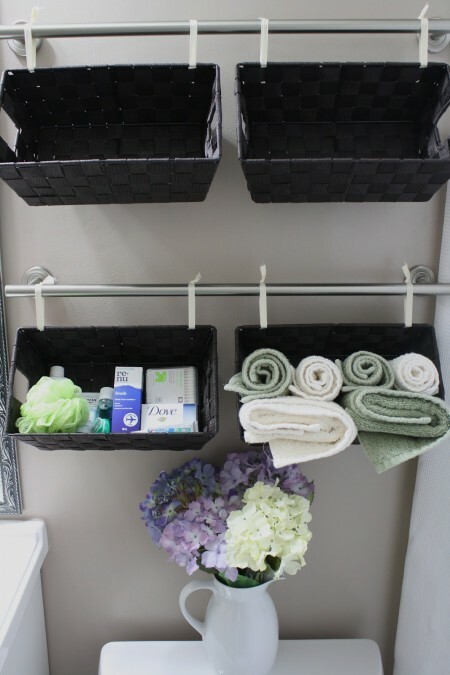 Try them out, and watch your bathroom transform into a spacious spa where everything is neatly organized and within arm’s reach. If you’ve been hanging on to any old doorknobs, candlesticks, bottle caps, or tissue boxes, now’s the time to bust them out. 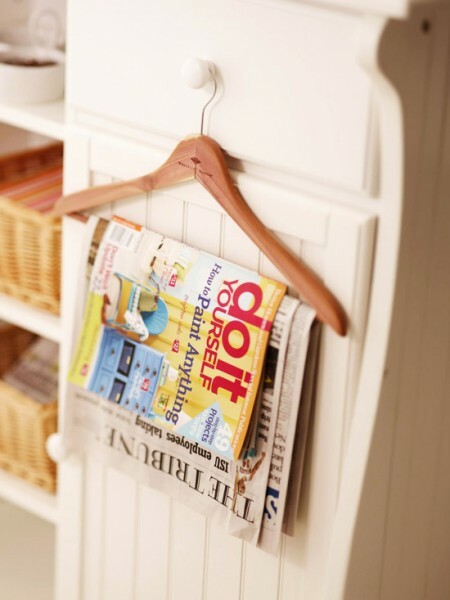 Want more awesome built-in storage ideas? 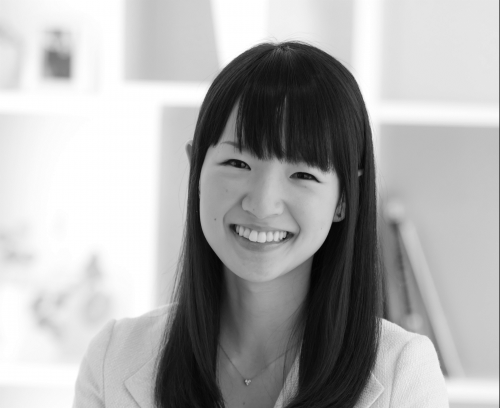 Check out this roundup from Apartment Therapy. “Wall of baskets” sounds like a project that could eat up your afternoon, but this Simply DIY 2 idea is actually quite easy. First, hang two parallel towel bars. Next, cut some ribbon and thread it through your baskets, tying them to the secured bars. 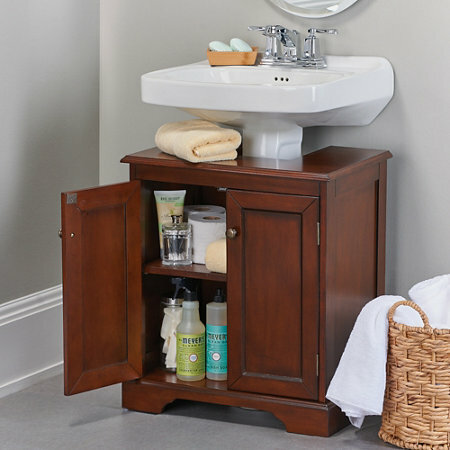 Finally, take whatever bathroom supplies are crowding your cabinets and store them in your four new mini storage units. This bathroom storage hack comes from Glamour, so the buckets in question are actually some pretty pastel IKEA FINTORP utensil holders. Once you’ve acquired those, just knot an all-purpose clothesline on the sides so there’s about eight inches between each bucket. Double-knot the clothesline when you get to the last bucket and cut off the excess portion. 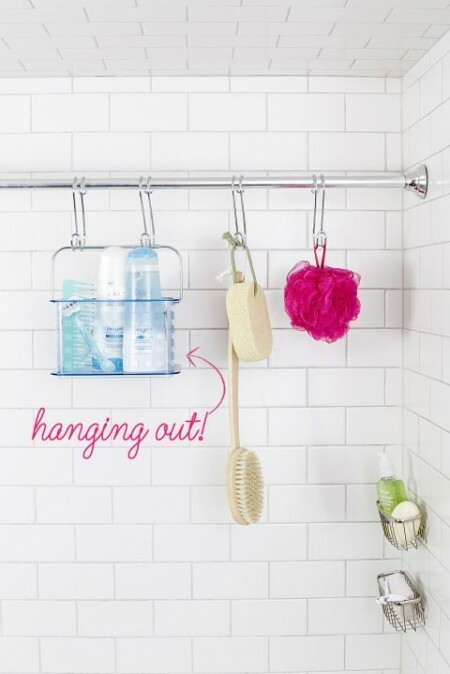 Then, hang the finished bathroom storage solution from a simple hook on your wall or door, and toss in your hair straightener, hairspray, makeup brushes, hair brushes, and other beauty supplies. 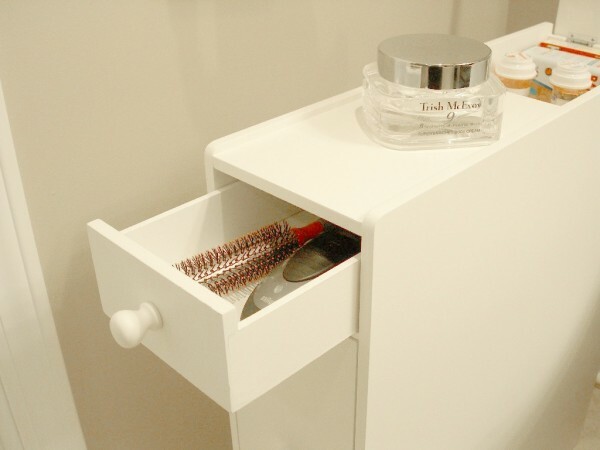 As you already know from our guide to decluttering your bathroom, file organizers and PVC pipes can make excellent hair straightener holsters. 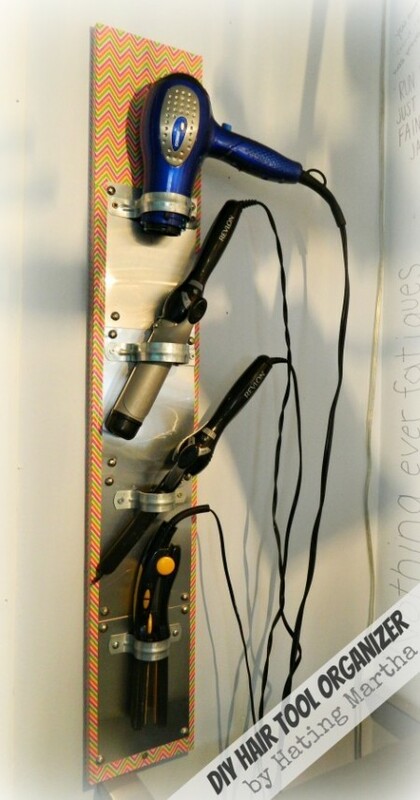 Janel from Nellie Bellie has another great solution for excessive hair tools with her DIY hair tool organizer. It’s essentially a vertical wood plank with aluminum slots, but you also get to customize this one with brightly colored duct tape. Pedestal sinks look super sophisticated, but they barely have enough space to stash a bar of soap. To help your sink live up to its full potential, pick up a curved organizer like this tiered rolling organizer from Bed, Bath & Beyond or this custom-cut cabinet from Improvements. 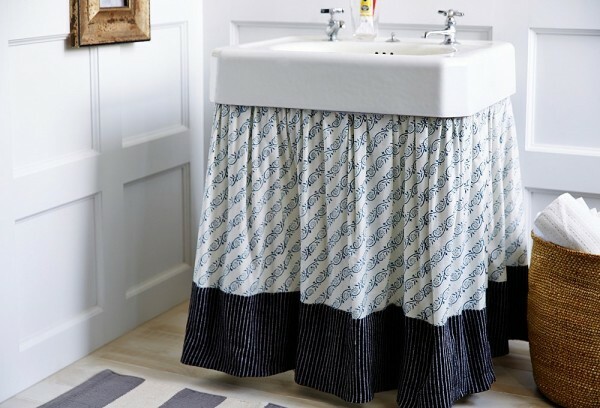 On the more DIY side, you could sew a skirt that matches your bathroom color scheme, attach it to your pedestal sink, and then stow a few storage bins underneath, where no one will ever see them. For about $11, you can snap up a 3-pack of StickOnPods, which are small adhesive organizers designed to store Q-tips, nail polish, and more. 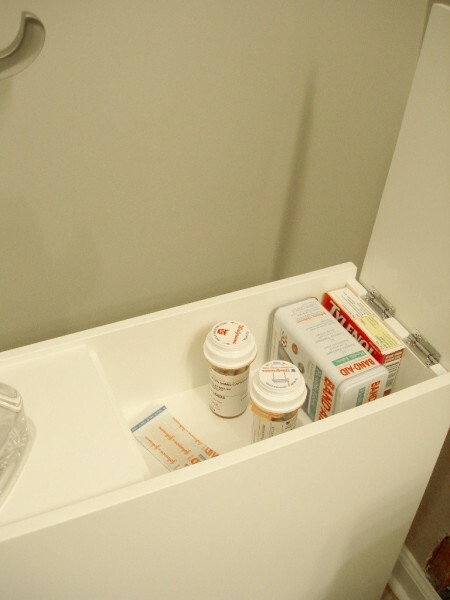 Attach the StickOnPods to your medicine cabinet door, and watch your bathroom storage space instantly increase while keeping your cosmetics neat and organized. Before you take out your recycling, save a 20L plastic bottle cap. 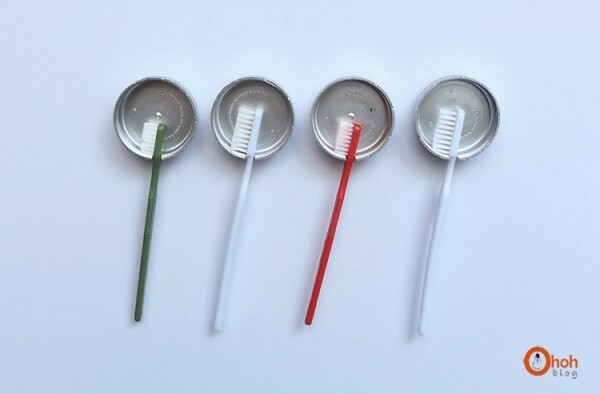 Because once you’ve made a small notch in the cap with a boxcutter and slapped some velcro on its back, you have a new home for your toothbrush. Hop over to Ohoh Blog for the full instructions. As HouseBeautiful notes, a slender picture ledge from IKEA can hold more than framed photos. 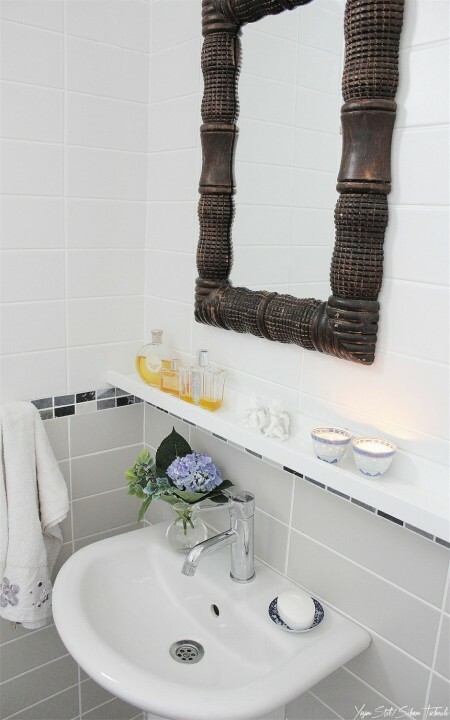 Add one right between your bathroom mirror and sink, and rest your favorite perfume or cologne, hand soap and lotion, scented candle, and hair products on top. It appears that this bathroom storage hack’s creator, Yasam Stil, went with IKEA’s MOSSLANDA, but feel free to shop the store’s entire picture ledge collection. Don’t have any ledge space for shampoo? By installing another tension rod inside your shower and then adding hooks, you’ve suddenly got storage space for loofahs, caddies, and even shower caps. 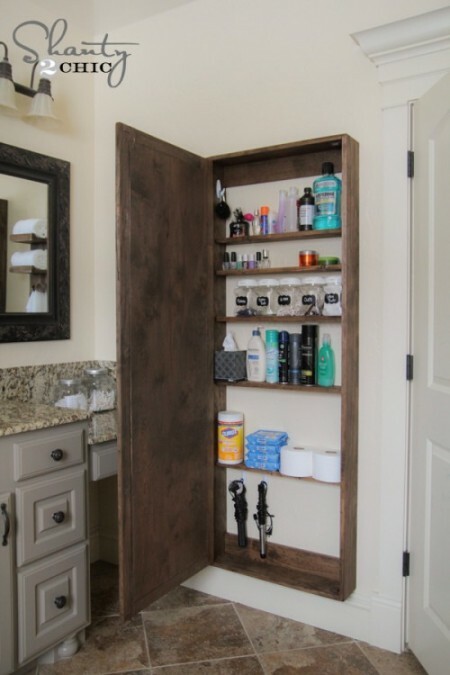 Provided you’re not afraid to get down with a circular saw, carving out a recessed shelf in your shower for storing soap and other toiletries is a very attainable goal. Here’s a handy visual guide from Apartment Therapy. 1. Lace hair ties through and around suction cups. 2. 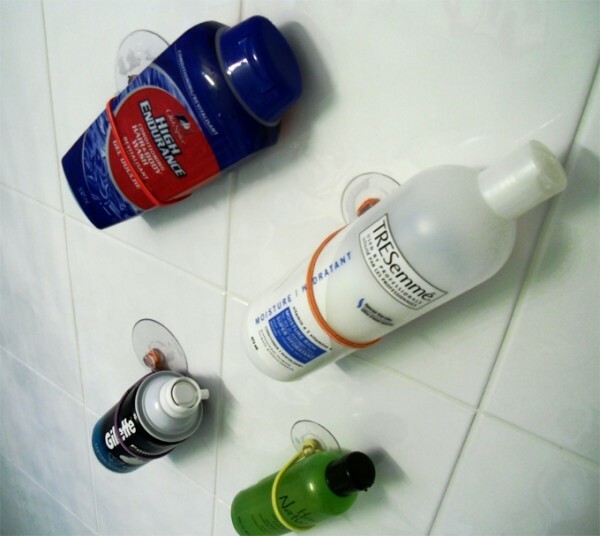 Stick the suction cups on your shower’s wall. 3. Slip your shaving cream, body wash, shampoo, and conditioner through the hair ties. Clearly, it’s called a “dollar store craft” for a reason. Don’t you just hate it when your razor slips off your shower caddy, lies on the floor, and endangers your feet? 1. Cut a piece of 1-inch-diameter PVC pipe into a 3-inch long piece. 2. Cut two ⅛-inch wide notches into the pipe. 3. 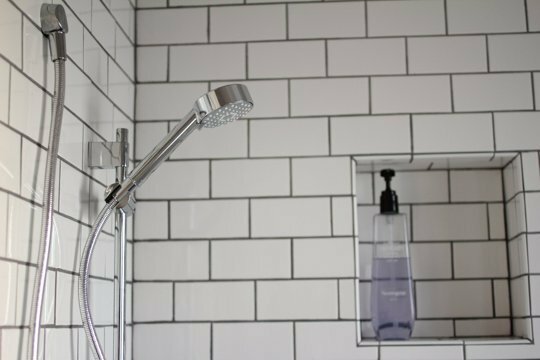 Strap the pipe to your shower caddy’s side by fastening plastic tie straps around the pipe’s notches. Parents, this one’s for you: Timothy and Laura Dahl of Built by Kids came up with an ingenious step stool that not only helps your toddlers reach the sink, but it also serves as a roosting place for their rubber duckies, ships, and more. 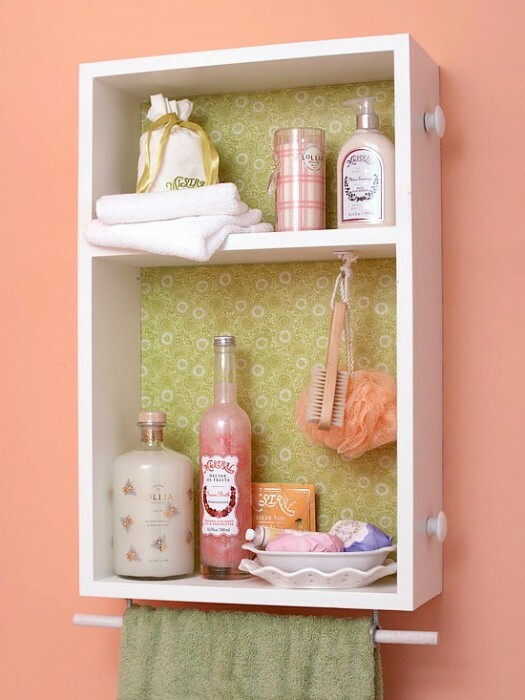 Follow these simple steps to build your own bathroom storage booster. Has your cake stand been collecting dust because you only bake cakes a few times a year? 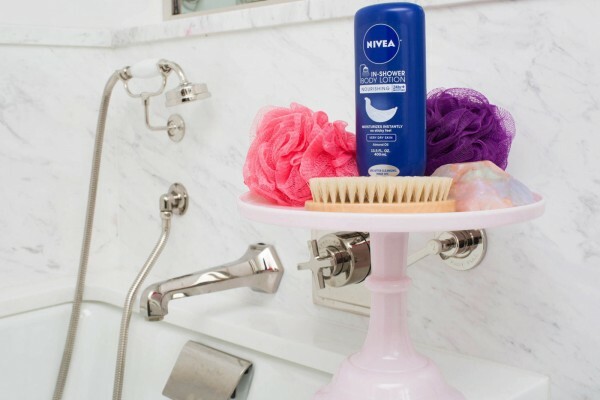 Repurpose it into a stylish storage stand for your shower accessories or the hair products you’ve got lying around your sink, just like Cosmopolitan did here. Don’t actually own a cake stand? You can quickly DIY one using two plates and a candlestick. Some people tap out after hanging one towel rack over their door, or sticking up two hooks. But what happens if you need to hang, say, at least five towels? 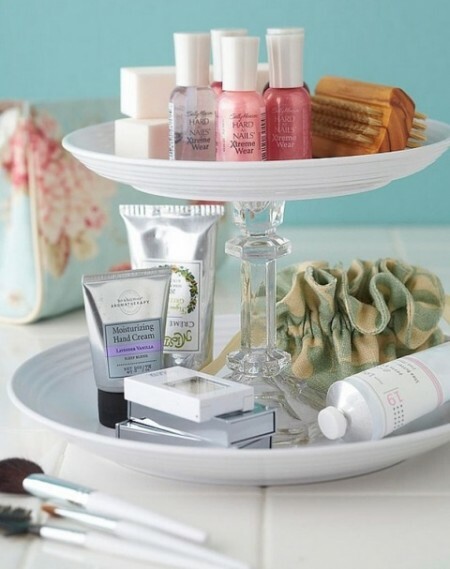 Be like Martha Stewart, who maximizes storage space on a bathroom door with a towel bar trio. If your medicine cabinet just isn’t working for you, no matter how many StickOnPods you use, consider upgrading to this tall (but slim!) 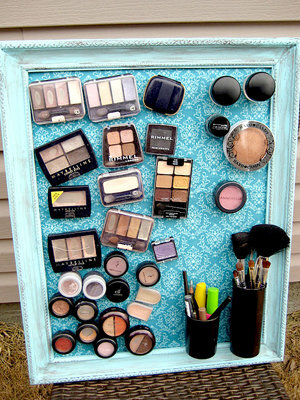 mirror storage case from Shanty 2 Chic. 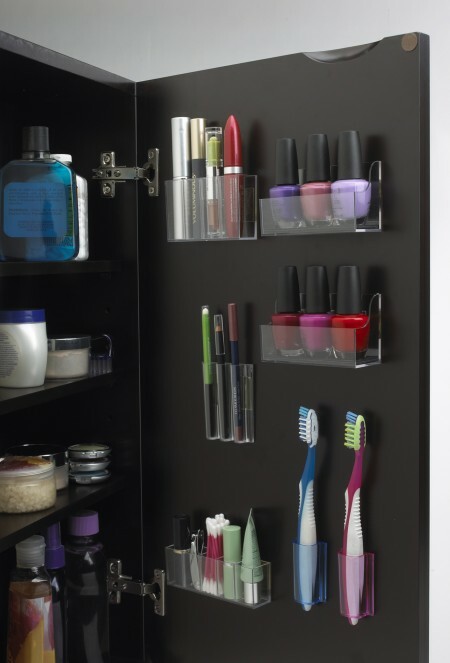 It gives you a full-length mirror (which will save you time getting ready in the morning since you don’t have to run back to your bedroom to check your entire outfit) plus a ton of storage shelves. And with the right wood stain, it looks catalog-ready. Have a ton of bath products that, despite you already knowing how to organize everything in your apartment, can’t seem to find a home? 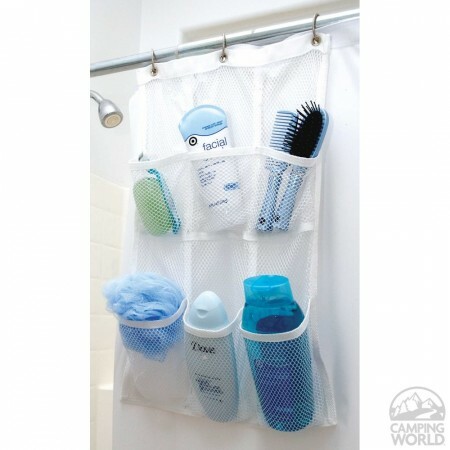 Solve that by hanging a plastic shoe organizer on the inside of your shower curtain. If the traditional 24 pockets seems a bit much, you can find a smaller organizer with just six pockets from Camping World. 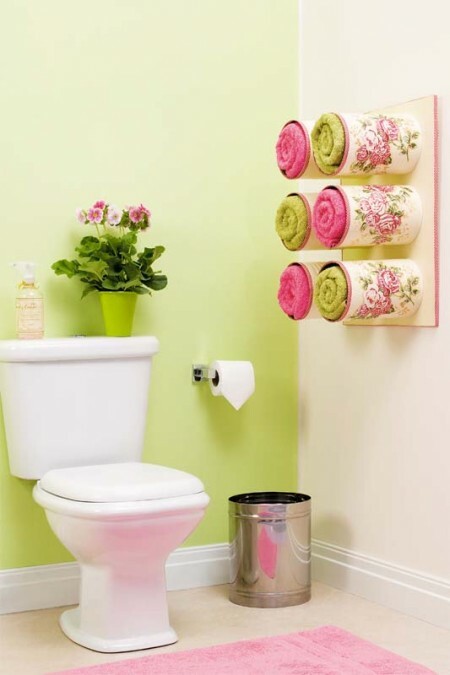 Some towel racks take up too much real estate in your bathroom. But definitely not this one. 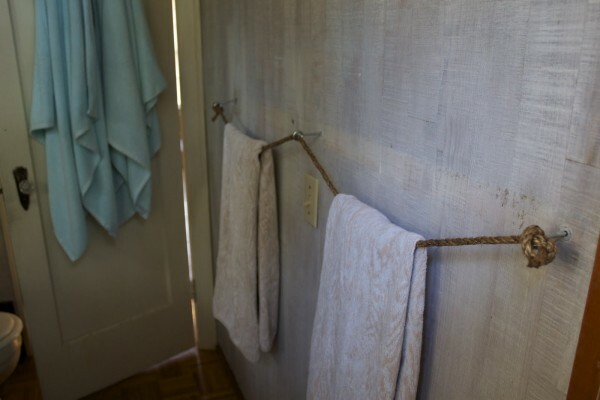 Using just three eye bolts and a rope, On My Honor created this space-saving towel rack that lays almost completely flat against the wall while giving your bathroom a nice rugged look. 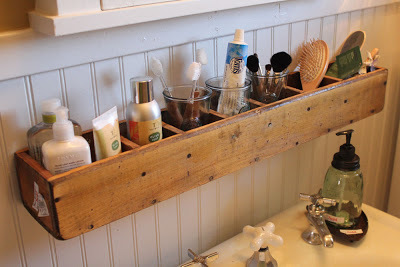 You’ll have to roll your towels for this bathroom storage idea to work, but wine racks can be great homes for your washcloths, hand towels, and even full-size towels. Doorknobs are like hooks, but with way more character. If you really want to get crafty, this DIY Enthusiasts guide shows you how to transform old tin cans into a pretty floral towel rack. 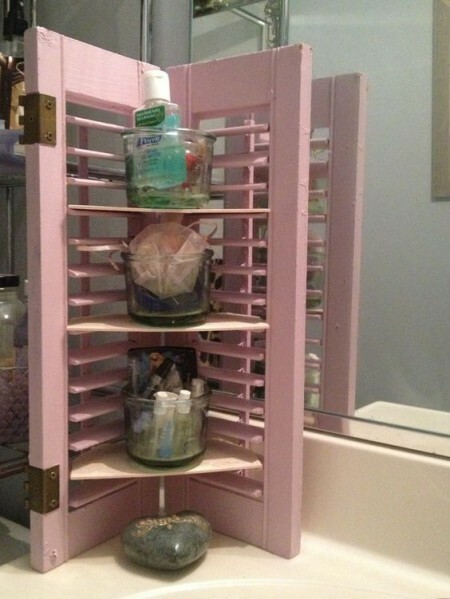 This bathroom storage hack is so genius yet obvious that you’ll be mad Ki Nassauer beat you to the punch. 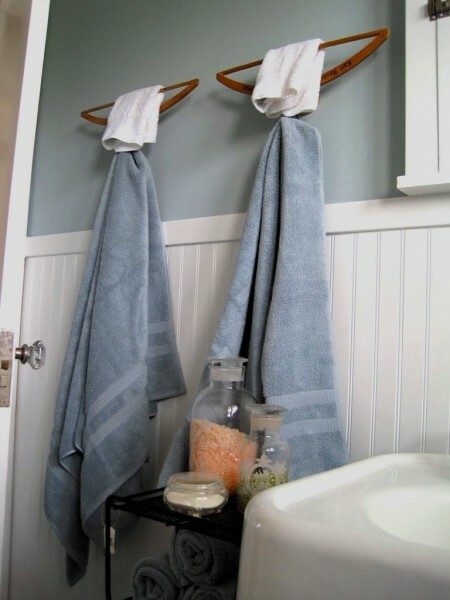 For this towel rack, you’ll need two wooden hangers and two dowels. First, anchor the dowels to the wall. Then, screw the hangers — make sure they’re upside down — into the dowels and you’re all set. 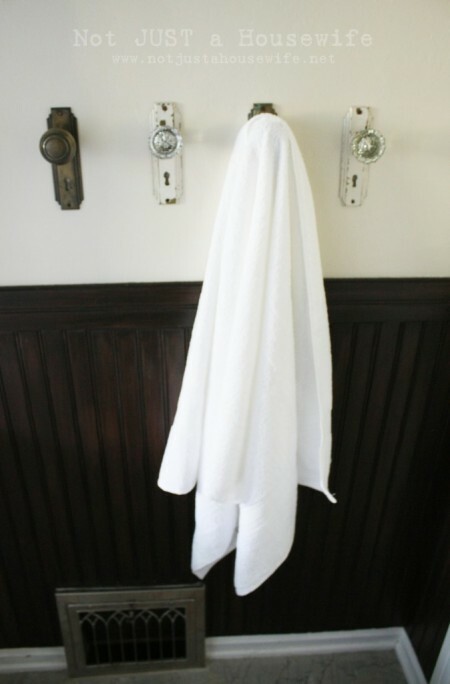 You can now hang your big towels from the hangers’ inverted hooks and your hand towels from the hangers’ flat bases at the top. Genius? Genius. Provided you have enough counter space for it, a Lazy Susan is a great place to store the grooming products you use everyday. And since they’re all together on one revolving stand, you just got back the time you sometimes waste in the morning rifling through your cabinets. 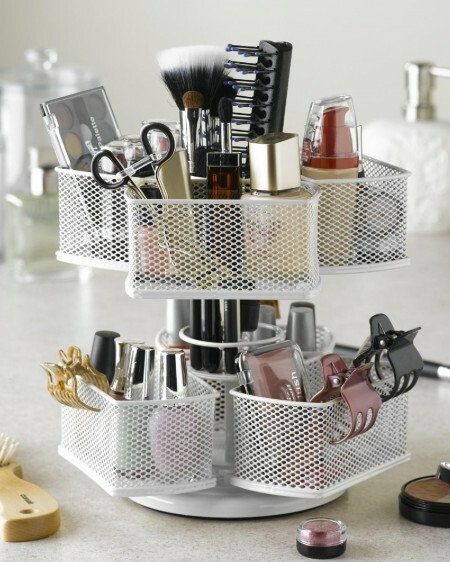 For even more counter space-spacing power, pick up a Cosmetic Organizing Carousel from Nifty Home Products. It’s like a Lazy Susan on steroids but without the dangerous side effects. 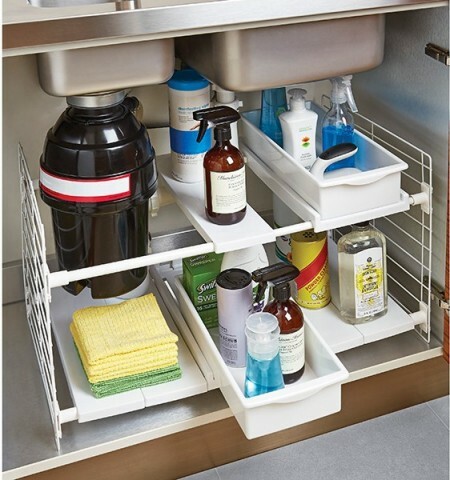 Thanks to its sliding shelves, a two-tiered organizer like this one from the Container Store fits easily around your pipes, and it gives you an extra adjustable shelf to store your bathroom cleaning supplies and sponges. 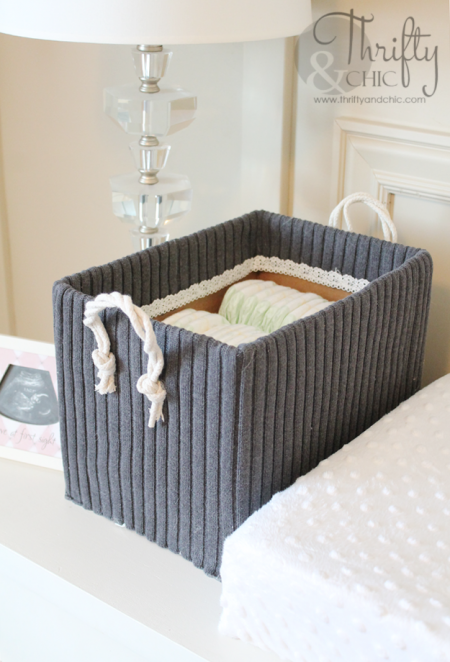 Thrifty & Chic lives up to its name with this DIY storage box. It’s recycled from an empty diaper box, old sweater, and a bit of lace and rope. If you’re forced to shop for a slender cabinet due to size constraints, be smart about it. 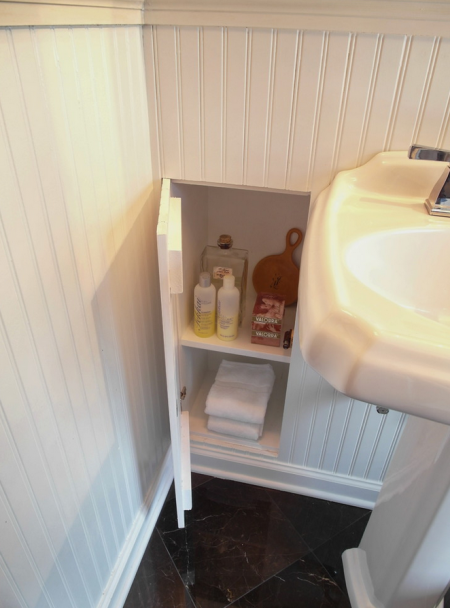 Look for one with shelves that give you a deceptive amount of storage space, and maybe even a secret compartment on top. Our top pick: the 22.75” x 6.25” free standing cabinet by Proman Products. 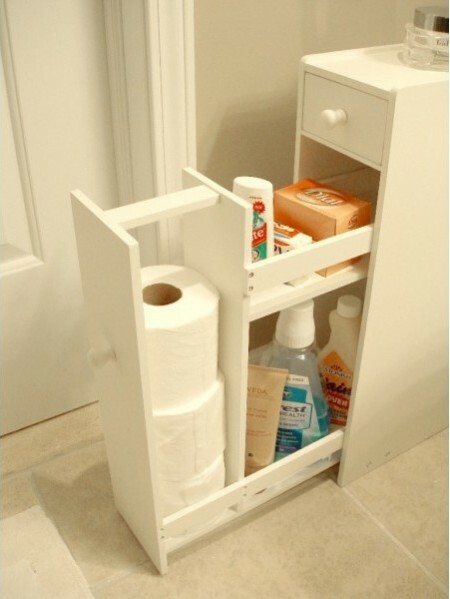 Beautiful storage space is a terrible thing to waste, especially if it’s right above your commode. 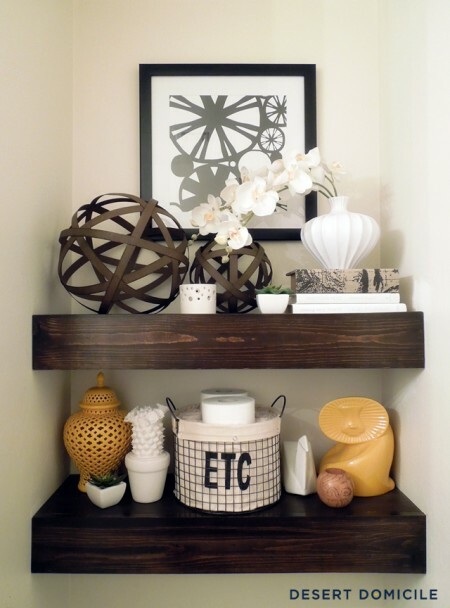 Luckily, there are plenty of storage solutions out there, ranging from the No Tools Bathroom Space Saver and free-standing wooden cabinets to floating wooden shelves and pipe shelving that you can easily DIY or buy. 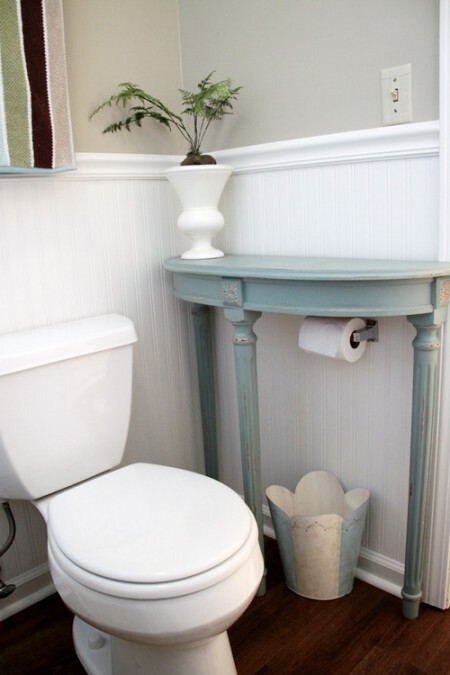 While redecorating an outdated bathroom, Southern Hospitality discovered that the right end table can also slide over the top of your TP holder and provide extra counter space for a small happiness-increasing houseplant. Not sure what houseplant is right for you? Check out our guide for choosing the best houseplants and planters for your apartment. This is one the best bathroom organization hacks for anyone who saves plastic bags and uses them to line his/her trash can. 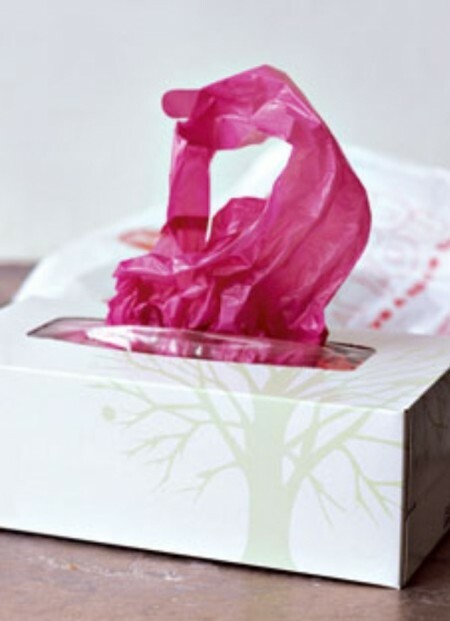 Rather than let the bags scatter and overtake the space under your sink, bunch them all up into a recycled tissue box. Doing so not only keeps them organized, but it also dispenses a new bag one at a time. It’s probably safe to say that you don’t want the Quaker Oats guy staring at you while you’re in the bathroom. 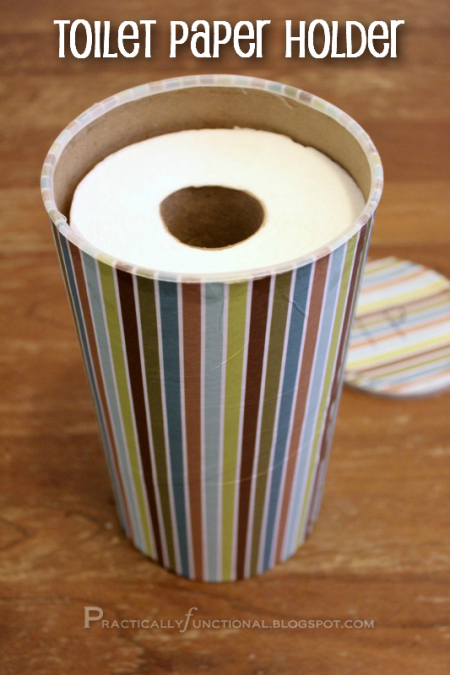 However, with a few handy tips from Practically Functional, you can upcycle an old oatmeal canister into a colorful TP container that you can tuck into a corner or on top of your John’s tank for fast access. 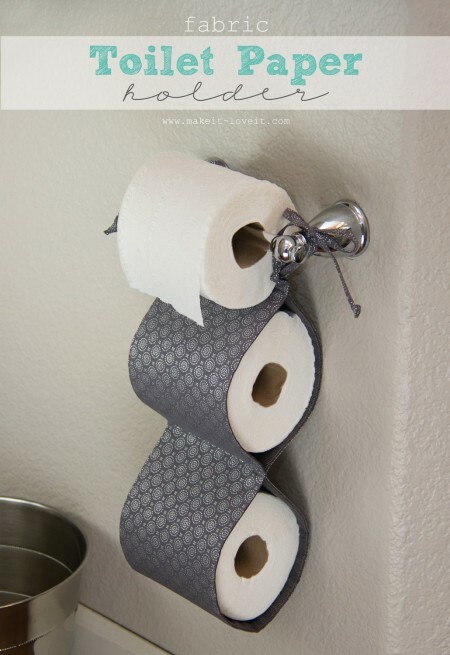 The first advantage to this fabric Make It & Love It TP roll holder? 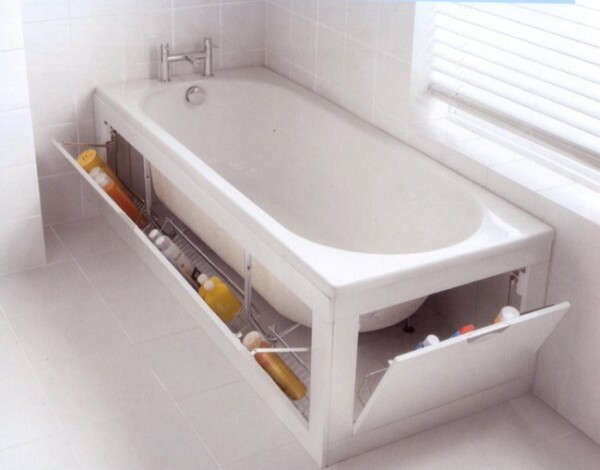 It hangs extra rolls that would otherwise claim cabinet or basket space against your bathroom wall. The second advantage? It places those rolls right under the existing one for quick and easy switches. A couple years ago, this revolutionary bathtub with opening panels set the Internet on fire. Unfortunately, the so-called Stowaway isn’t for sale, but if you’re feeling incredibly ambitious, you can try adjusting your bath panels yourself. Maybe just consult your plumber or YO Home!’s designer first. 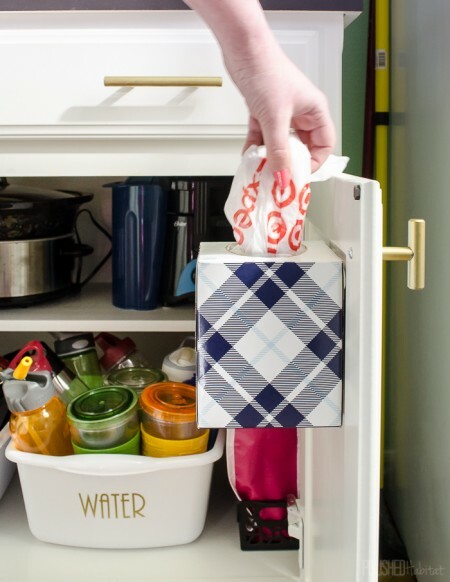 Let’s be real: The best bathroom storage hack is having someone else do all the work for you. 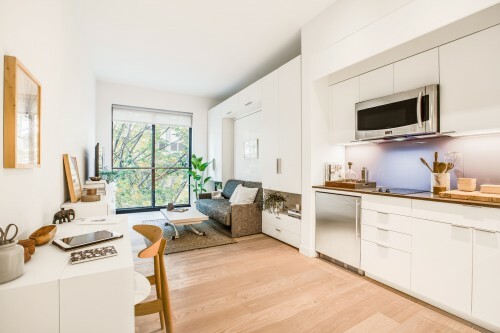 So schedule a MakeSpace pickup, pack the stuff that you no longer want eating space in your home, and we’ll take care of the rest. Seriously. We’ll pick up your stuff, store it in our secure storage facility, and create an online photo catalog of everything so you always know what you have in storage. And when you need something back, we’ll deliver it to you.